Luis Escobar knew he had to run in Central Park. The professional photographer and avid runner from California was in New York City for a television appearance, and he couldn’t pass up the chance to experience the urban forest first hand, so he turned to social media looking for someone to lead him on a run. He quickly got a reply from Terence Gerchberg, the Executive Director of Back on My Feet NYC, who told Luis to meet him at Columbus Circle the next morning. Luis still had to figure out exactly where that was and how to get there, but he’d found a guide. As they introduced themselves to one another running through Central Park, Terence explained what he did for a living and laid out the BoMF’s purpose. The simplicity of the mission and the impact it had blew Luis away, and he knew immediately he wanted to be involved. When they finished up the run, Terence invited Luis to an event that night; a celebration for Team Uptown member Dale, who had reached 1,000 miles run with BoMF. For Luis, the evening provided a window into the organization and gave him a chance to meet the people who made up the BoMF community. Through the chance meeting on Facebook, Luis had been introduced to Back on My Feet and a connection had been forged. 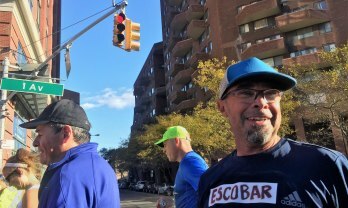 Months later, he came back to New York to join BoMF for the New York City Marathon for what would become be one of the most proud and profound experiences in his time as a runner. At a BoMF event the night before the race, Luis spent a bulk of the evening speaking with Dale. Luis says they “hit it off”, and by the end of the night, they had agreed to run together the next day in what was going to be the Dale’s first marathon. During the bus trip and ferry ride to the starting line the next morning, Luis listened to Dale tell his story; the issues from his past, how he’d found BoMF, and how he’d made it back to this point, set to run his first marathon. As he prepared to run 26.2 next to a man who had been through so much just to get to that starting line, Luis gained perspective. “I realized that the marathon itself, the four hours that he was going to run, was just a very small part of his journey,” he said. “He had set out a goal to complete the race and to continue making changes in his life, and Back on My Feet made it all possible for this guy. When they crossed the finish line together, Luis watched the sense of accomplishment wash over his new running partner, and saw the power of what BoMF could do. In the end, the experience affirmed something that Luis had long believed, that running, and the community around it, can have a major impact. In watching the effect that Back on My Feet and its programs can have right in front of his eyes, he saw just that. Just as he did several months back when he first came across Back on My Feet, Luis left New York inspired and energized by the mission.